Cybrtrayd 45St50-A016 Elephant Lolly Animal Chocolate Candy Mold with 50 4.5-Inch Lollipop Sticks by CybrTrayd at Animal Backgrounds. MPN: 45St50-A016. Hurry! Limited time offer. Offer valid only while supplies last. 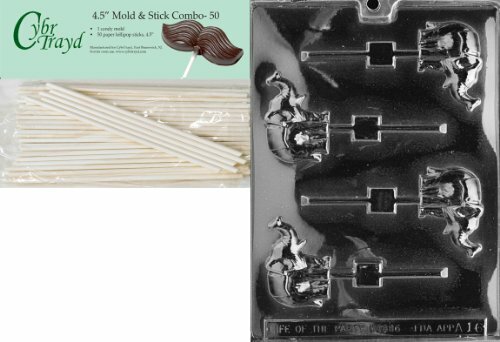 This mold and Lollipop stick Bundle comes packed in a sealed, protective, clean poly bag imprinted with Copyrighted CybrTrayd Molding instructions. Bundle comes with 50 paper lollipop sticks, 4.5"